It's the last Friday of the month, which means that it's Update Day. In case you're wondering what it's all about, a few of us writerly types went and set some major goals and we share updates on our progress toward those goals once a month. If you would like more information or to join in, click here. Yeah so I honestly have no idea where November went. I don't know if it's because of my life getting another curveball (a good one this time, fortunately), or if I'm just really that exhausted, but it keeps feeling like I'm stuck in a reactionary kind of mindset. On the one hand, that's not too bad. At least the things I'm having to react to right now are mostly positive. But the problem is that I can't build anything when I'm spending 90% of my time reacting to unexpected events (and 10% recovering from that). I guess the issue is that lately, the nature of the things I've been working on building toward have opposite qualities to the writing goals I've been pursuing. 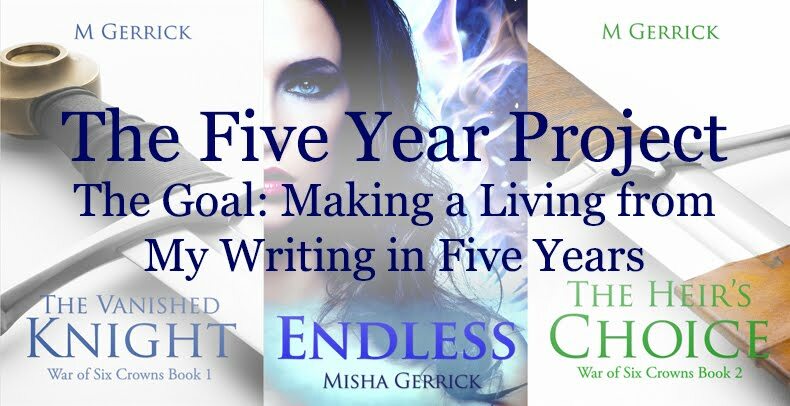 With my writing goals, I had this massive goal and no real certainty of how, or even if I'd be able to make it. So in lieu of that, I engaged in short-term goals that would give me a short-term sense of accomplishing something. For example, wanting to write 1,000 words per day meant that I might eventually be able to become successful as a writer. But in the meantime, I still had something written and created to show for my short-term efforts. This thing I'm building on the side with my family... I'm 90% sure that it's going to be hugely successful if we can cross a few hurdles in the way. Here's the thing, though. Even if I do achieve something now, the impact is long-term. So in a month like this, where a significant portion of my mind-space was devoted to this project, I keep feeling like I spent my time on nothing. I guess because I'll only really see what I did today much later. I'm kinda in the same place with the other thing that I've been focusing on this month. I joined a yoga challenge, where I do yoga for 30 days straight. I do feel better after every session, but I don't really "see" the impact until maybe a week or so later. And really, my mind's not liking this lack of immediate gratification. I suspect it might be part of the reason why I've been so exhausted and drained. Last weekend, I took the two days to randomly pick items off my to-do list that have been waiting for months now. The happy coincidence of doing this was that most of the things I did meant I had something once I was done. Like unpacking boxes in my room meant that I have a slightly tidier room and the feeling that at least one thing (one box) was finished. Another thing I worked on was the wireframe for my temporary author website. This is something I've basically been threatening/promising myself to do since April. It's almost done. And every page I created for the site feels like a rush. So much so that I have no idea about whether it's any good, but just seeing something literally take shape under my hands was so good. Takeaway lesson for me: Do something with a short-term benefit every now and then. Sometimes we get so stuck on long-term goals that we forget to just do things for the here and now. In December, I'm going to take off for a few days from Christmas into New Year, and I think for that week, I'll basically be indulging my whims around just creating whatever I feel like. But for that to happen, I'm going to have to graft in the rest of the month to make up the "lost" hours from that week. So that means I'm going to continue being quiet until around New Year's Eve, as per my tradition of resetting my goals at the end of the year. It is positive you're pressing forward with written words when possible, and that there is the 90% factor working toward something big! I just had a couple novellas released this past month, and have been working with the narrator of a couple of audiobooks in production. And I will be writing too--along with teaching and village council and family and so much more. Life is always busy and, Misha, it is very good to see you moving forward, busy and all. Yeah I'm hoping that I'll start being able to get more things done once I fall into more of a routine. Best of luck with the new novellas! That's a good idea to sprinkle in short term goals with the long term ones. You can also break up a long term goal into shorter pieces, so you can see more progress up front. Best of luck! That's a really good idea to get some short term goals knocked off a list.I should make a list of small things I could do for when I have a few minutes to kill. That's a really good idea. I generally don't go that small, but I do make myself do some things in five minutes when I can (like doing one thing to tidy up my room), because those odds and ends actually add up. I love crossing things off my to-do list, so I love to have those short-term goals handy. That sense of satisfaction certainly helps me keep going with those long-term plans. Happy December! Enjoy your time off! Yeah it's easy to underestimate the meaning of those small achievements, but that boost we get from them might end up being the thing that gets us through to the end of our big goals too. You certainly have come a long way since I first came to know you haven't you? Just popped in to see how you are doing and to wish you blessings for the coming year, Geoff. I was wondering if you were still doing this! It's why I hopped over today. I really want to be involved in it with the new year, but I hope it's okay for a lot of my goals to be non-writing. I'm tryig to get in the mindset that writing is a hobby and have other goals this year!